Paul Bennett was my cousin. His brother Tommy also ran the (2) projectors. Clyde Pohlman was Tommy's son-in-law. 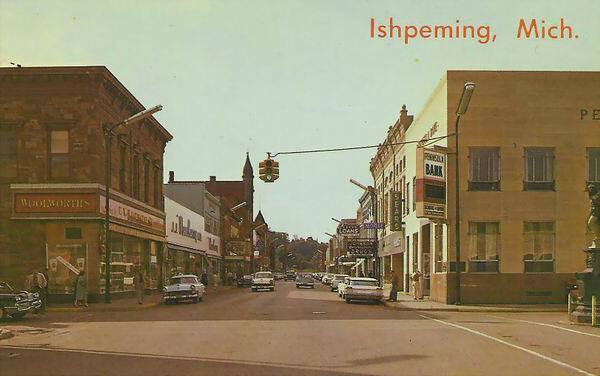 Always enjoyed going to Ishpeming, and sitting in the projection booth with Tommy. A white mark on the film would signal it was time to start the other projector that had the other reel of film. I was the last owner of the Butler Theatre. Originally built in 1915 strictly as a movie house, it seated 550 and the screen was near the back wall. Music was originally supplied by piano. It was the largest strictly movie only theatre north of Milwaukee, built by businessman Ed Butler. In the late twenties and early thirties, it survived the economic hardships of the depression and the ups and downs of the local iron ore mining business by being used as an indoor miniature golf course, a roller rink, and venue for boxing. In the late 1930''s, Fox Midwest purchased the Butler and brought it up to standards with new electrical and heating. They also remodeled the auditorium to an Art Deco look in pale turquois and pink as it was when I first came to the U. P. in 1977. I was managing the Airport Drive-in Theatre when I was asked by owners Paul Bennett and Bernard Bunzy McManara to come and manage the Butler. It was like walking back in time. concession stand candy, pop, and popcorn was 15 and 20 cents. The owners still had a doorman, and of course the old Simplex arc projectors were run by projectionist Clyde Pohlman. After running it one year, My brother and i purchased the operation in 1978, and over the next 10 years began restoring the theatre with our own money. The outside facade was painted in colors to match the original, the concession and projection areas brought into the current century, and the auditorium was completely repainted, carpeted, and new seats installed on the main floor. The balcony and box seats were kept original, so that the balcony could kept being used through a grandfather clause. The final capacity was 400 seats. There was not a holiday season or first run blockbuster that the house did not have at least 2 sellouts on opening weekend. 4 concessionaires and 3 ushers were common during these shows. We installed the first 6 channel Dolby Stereo systtem north of Green Bay WI in the 1980''s with a benefit showing of Francis Ford Copolla''s The Black Stallion for the Public Radio Station. A thrust stage was constructed in 1982, along with a new 40 foot wide true cinemascope silver screen for 3-D installed. An orchestra pit was built with the installation of an electronic Wurlitzer Theatre organ (installed in 1984). We would have one to two week runs of stage shows (local and regional) during the slow times, and many variety benefit shows were also held. I would play the organ at every Holiday, and before first run Disney family shows ( I have been playing theatre organs for years including the Detroit Fox, The Milwaukee Riverside, and continue to do so at the Ironwood and Crystal Falls Theaters in the U. P. ). The last big show that set records was in 1994 with the Lion King running 6 weeks with four shows a day (of which I played the organ at all but two shows). not bad for a 400 seat theatre in a town of 6000 people. The auditorium has a bandshell design with near perfect acoustics. It only took the Dolby Engineer from Chicago to balance the speaker system (LEFT-CENTER-RIGHT on stage, 8 SURROUNDS main floor, and 4 SURROUNDS in the balcony) in about 2-1/2 hours. the shortest time he said it ever took him for a Lucasfilm approved system. 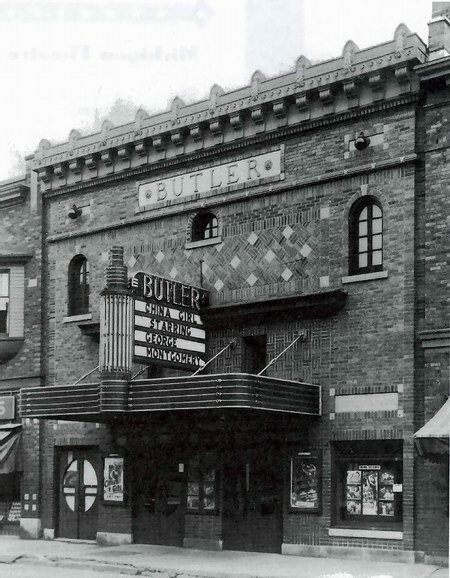 Record albums were recorded in the Butler, along with other projects too many to list here. The real history of the theatre goes back to the world premiere of Otto Preminger''s Anatomy of a Murder in 1959. In the box seats that night were James Stewart, Lee Remick, Eve Arden, George C. Scott, Orson Bean along with many local dignitaries. The soundtrack was composed by Duke Ellington, and he and his orchestra stayed just down the street in the Historic Mather Inn. As all good stories must come to an end, the George Kerestoes Circuit built a 10 plex in Marquette, and that spelled doom for the Butler. We did discount shows, and still made ends meet with family bookings, but it was decided to close the theatre in 1996. When it was purchased for use as an antique mall, the new owner respected the integrity of the building and architecture, and after leveling the floor to meet the stage, all other portions of the theatre remain intact. Even the gold grand drape is still there. 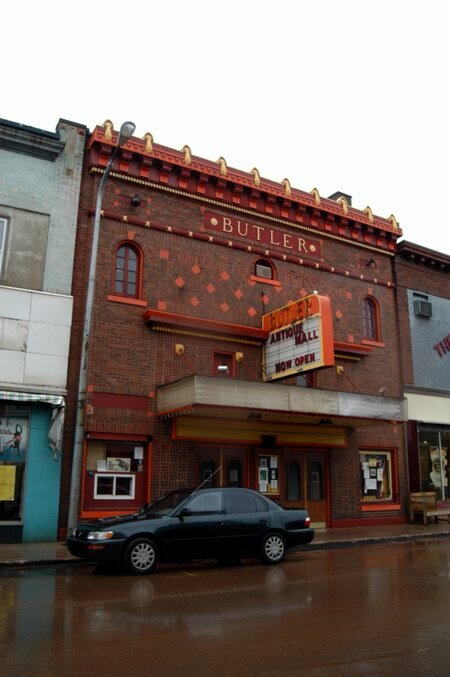 The new owner has said that if the time ever came when the Butler could be returned back to a movie/stage theatre, very little work would have to be done. 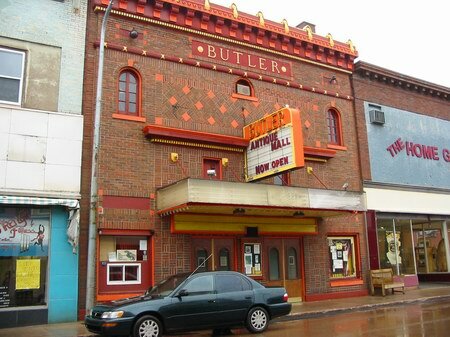 If you are ever in Ishpeming, stop in and see a historic theatre that still stands proud. I hope to add photos from past history up to some of the gala holiday shows very shortly. 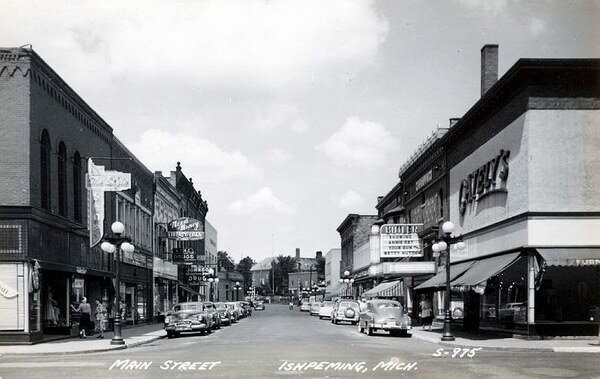 As an active member of the Ishpeming Historical Society and the owner of the Butler Theater and Antique Mall, my goal is to create a historic enviornment which is appropriate for the structure. Previous owners and multiple remodelings have NOT been kind to the Butler. And what era to restore to? Original 1915? 40s? 70s? I have to make do with what elements of the building remain and since money IS an object, complete the rennovations over time. 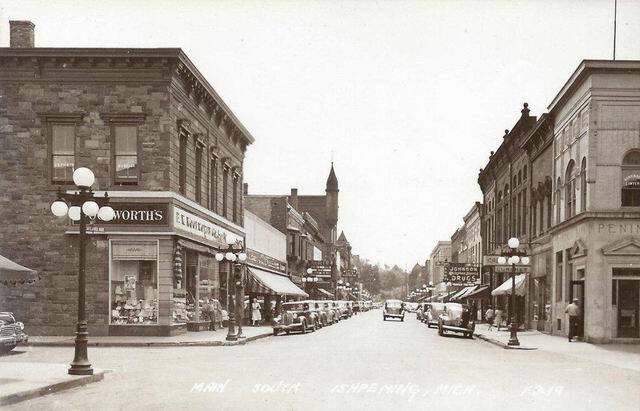 There are 4 antique stores and several interesting specialty stores, and 2 old fashioned mom and pop diners as well as one of the best outdoor stores in the Upper Peninsula, in downtown Ishpeming. The seasonally operated Cliffs Shaft Museum houses mining items, as well as the Ishpeming Historical Society and the Rock & Mineral Club. IF you take the time to look, there is quite a lot to see & do here.